Lost Levels :: View topic - Garfield: The Lost Levels (SEGA Channel) Lost Levels - A website about unreleased video games. This is something that has been bugging me since 1995. I'm sure that I'm not the only one that has noticed the strange things that happened with Garfield: Caught in the Act for the SEGA Genesis, during its development. I remember it was one of the games I anticipated the most at that time, and I used to stare at the pictures that could be seen in the previews hoping to get it as soon as it was released. Time passed and I bought it. It was more expensive than usual, but since it was going to have so many levels I guessed the high price was caused by the cartdrige size. As soon as I turned the MegaDrive on, the first unexpected thing popped on the screen: The title screen wasn't the same I saw in the previews. It wasn't anything great or too bad, just different enough as to start fearing the worst. Since it featured a couple of teaser items (including a rocket from the space stage), I guess my desire of playing the game already just forced my subconscious to ignore that detail. First contact with the game itself. It looks and sounds pretty good. A couple of gameplay issues here and there, but nothing that would make the gameplay any frustrating. Then finishing a couple of levels, I realize that one of them didn't feature one of the most anticipated areas, which even appears in the box of the Genesis Nomad (specifically, the train in Catsablanca ). At that moment I guess I thought something like "Cool, there must be some secret areas in this game! ", so I continued playing. And after a couple stages more, the title Season Finale appeared. I finished it, and with it the whole game. After that, I was completely shocked (probably even more than the first time I finished Sonic 2 and didn't get to see the Hidden Palace). So where were the space and viking stages? Maybe they were secret levels as well? But the sound test didn't feature any more BGMs than those I had already heard! Needless to say, I never got to play those levels from the preview. Interestingly enough, the GameGear version had at least the viking level (I don't know about the others since I've never played it), and some time ago I was told that the PC version (a straight port from this game) even had a level called Alien Landscape (where the rocket in the new title screen came from). So what was going on? One day, I found a list of games made exclusively for the Sega Channel and there was a game called Garfield: The Lost Levels, which was said to include the stages that didn't make it to the final Genesis version. This could be the answer. My guess is that, since this was one of SEGA of America's biggest projects at the time, they decided to split the game in two (like they later did with Clockwork Knight for the Saturn), and release half of it in cartdrige and the other half as an exclusive for the SEGA Channel, so more avid Garfield fans would subscribe at a time when their subscriptions were going down dramatically. But they didn't take into account (read: "didn't care") that the European users didn't have access to such device, so we never had the chance of playing the whole game (at least we got MegaMan: The Wily Wars in cartdrige form). As a side note, it looks like, with or without lost levels, the game was conceived as an even bigger project, with more stages than we've seen. 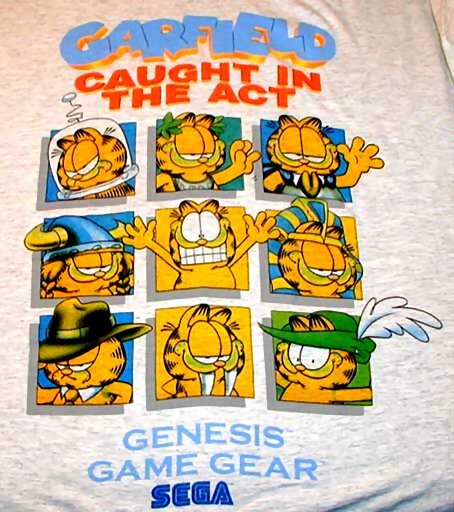 There's a promotional Garfield: Caught in the Act T-Shirt featuring an illustration by Jim Davis, and it includes some of the known characterizations for Garfield plus a couple more. Anyway... I'm just guessing in the whole "let's split the game so we will make more money and save the sega channel haha" assumption, and maybe there was a real hardware limitation that prevented such a big game to work properly. But since the magazines had shown some real in-game screens, and since I found out that a large part of the ROM consists on some of the previous data copied and pasted with some added random garbage, I'm starting to think that it's the only possibility. Does anybody know what really happened with this project? I played "The Lost Levels" back in the day. It had that Catsablanca level, a snow level, and I think one or two more . I don't remember anything else about it. Here's the t-shirt pic I mentioned (I just found it in some old backups). I remember I had to change the brightness and contrast levels from the original pic so the colors would look more recognizable (I wish I knew where did it come from, this site had a lot of old SEGA promotional t-shirts). The last two levels are the only ones I've never seen a pic of, but I wouldn't be surprised if the Robin Hood stage was originally intended to be like the typical, easy to get through, forest zone to play at the very beginning. Playing the Transylvania level as soon as the game started felt a little wierd, in my oppinion, specially as it could scare the younger Garfield fans right away. Bock, from SMS Power, has finally released the GameGear version (developed by Novotrade), and not only it does include the viking level (Bonehead the Barbarian), but also the forest level (Slobbin Hood) and an extra stage in Catsablanca that might be similar to the lost train level, only this time there's some neat looking cars instead of a train. Unlike in the PC version, there's no Alien Landscape in there, though. Now there's only one stage we've never seen screens from, but they might have just replaced the Rome stage for the pirates level right after the T-shirt was made. Nifty. Yeah, it's interesting how sometimes the "little brother" versions have features the main game itself didn't. I never actually got around to playing it, but I remember reading years ago that the SMS Spider-Man game had the black symbiote costume, minigames, etc. that the Genesis version didn't have. I always thought that sounded so cool. 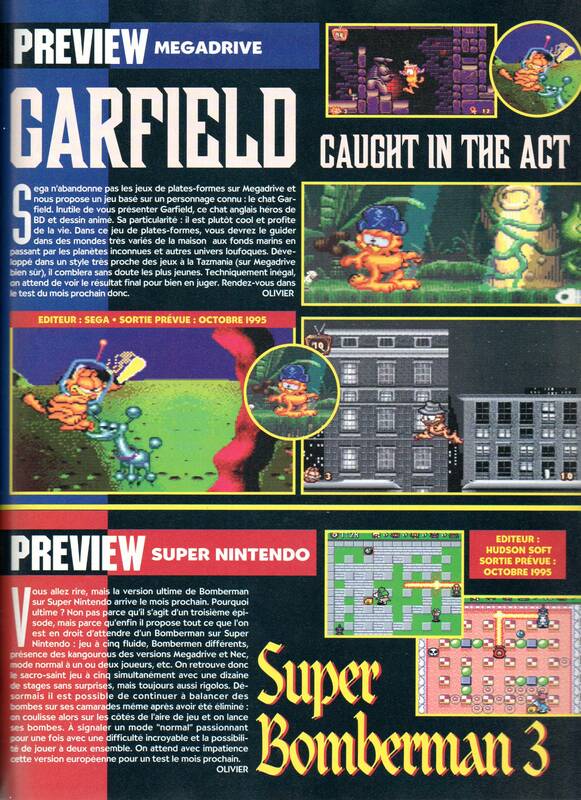 I found these screenshots of Garfield: Caught in the Act on the french magazine Joypad in their September 1995 issue. These shows the scrapped train sequence and the alien level. Definitely a shame about the train level... this prototype has become quite interesting to research and follow. Has anyone checked to see if there might be a early review copy floating around somewhere? Perhaps the bases already been covered here- but the staff at these magazines, or even Jason Wilson might be worthwhile to ask. If they happened to still have a beta copy, it's definitely a possibility some of the lost content might be on there.